Our product range includes a wide range of disposable sleeve cover. Our company has achieved a milestone in offering Disposable Sleeve Cover to the clients. 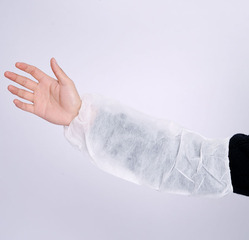 Disposable Hand Sleeve is available in various colors and can choose whichever they want. This product has outstanding flexibility and offers seamless protection for hands from hazardous substances. Offered range is precisely engineered and designs by the professional of the industry with the best quality of raw material and cutting edge technology. This product is tested on various parameters of quality before delivering to customers for ensures superb quality and other attributes. Looking for Sleeve Cover ?